First, in PowerShell ISE we can define some functions. $pwd = Read-Host -AsSecureString -Prompt "Enter Password for Client $clientName"
Write-Output "Connected to Office 365 & Exchange"
These are pretty straight forward, with Connect, connecting us to 365 and Disconnect removing all of our current sessions. Next we can set our credentials for our various tenants. Again, reasonably straight forward, we have defined the usernames for our two tenants. Next we have a small menu to build. 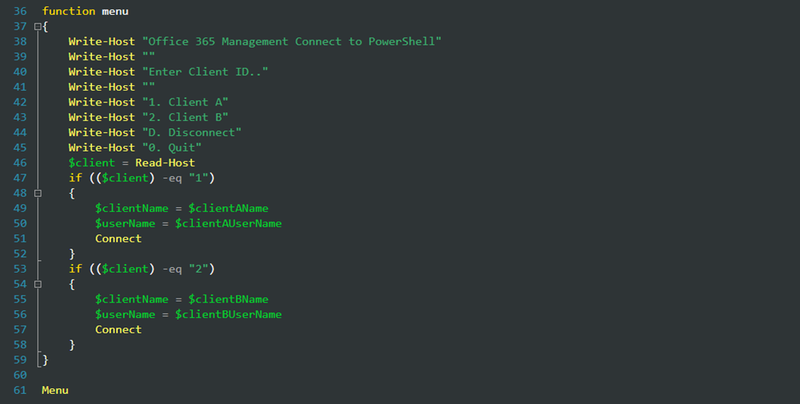 Write-Host "Office 365 Management Connect to PowerShell"
The menu will give us the option of choosing Client A (1) or Client B (2) it then prompts us for the password for that account and connects us to Office 365. Of course you can keep adding more clients and expand the menu to include the additional Clients. Save it as something memorable, like 365.ps1 and fire it up. Not ground breaking by any means, but something i find useful. Following some useful comments below from Mark Watson, i created this today for using Delegated Admin Credentials. Write-Output "Enter Office 365 Credentials.."
$clientChoice = Read-Host -Prompt "Select Your Client"
Once the script finished the $tenantID variable is loaded with your chosen clients TenantID Guid. Nice script. It will be very handy. Thank you. Thats probably just my bad cut and paste job! – fixed. Nice share, we did something similar but opted to use our delegated admin rights coupled with the TenantID, we supply the Org Name and build the connection from there. Doing it this way means you don’t need to lookup/remember the clients admin credentials, you just use yours. I tried this modification but the script just continues to run with no output. I am trying to use this mod so we can continue to use our credentials but it doesn’t seem to work. when I connect using my credentials and perform a get-msoluser or get-mailbox, both cmdlets report my own domain for my MSP credentials. Never the remove client even though I select an option. I run the $client variable and like I mentioned in another post, it seems like it automatically defaults to the very last entry on my list of 39 entries. I would really love to manag our tenants properly with PowerShell but so far none of these work and I have no idea why. Is each set of credentials defined as a unique variable? Do you mean am I using the very first script where he built a menu and has client A with this admin logon and client B with this admin logon? If so, no… Although that is the only one that is working as I would like it to. I was really hoping to take advantage of the delegated admin rights but the connection context is different as I have mentioned in a different reply below. Hello, I have been using your script to manage our tenants. Something I have noticed is when it provides us our list of tenants. I enter a number, say “30”. It uses my delegated credentials and connects to that tenant. However, when i try to run commands for that tenant like get-msoluser, it is listing my organizations people and not the tenant. If I do get-mailbox, it is the tenant, however the wrong tenant. It automatically for some reason defaults to the very last tenant on the list. Something is wrong with this script. Has nobody else experienced this? Please someone get back to me. I am having issues with your scripts and we are an MSP with many clients and these would be so helpful if they worked like we thought they would. If I use the script at the very top of the page where you specify the respective admin account for each tenant (which would take forever btw), it works perfectly. If I do get-msoluser or get-mailbox, both report users in the tenant I want to work in. The dynamic scripts below don’t seem to do that where I use my partner credentials. It seems to connect to Office 365 with my MSP domain but connects to Exchange as the tenant, however it is the wrong tenant, it seems to pick the very last one in the msolpartercontract list. I am very close but something just isn’t quite right. I really hope someone can guide me in the right direction here. Thanks a million.